This weekend, the Off The Radar event returns to Westbourne Studios in East London, bringing with it a selection of the world’s biggest streetwear brands and your opportunity to pick up classic kicks from the folks who put on the Crepe City sneaker event. 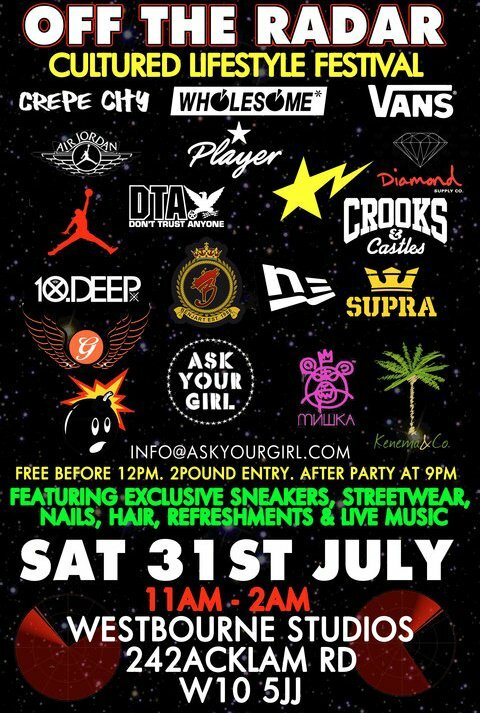 East London store Wholesome will be there showcasing their stock, including the likes of Crooks & Castles, 10 Deep, Supra, Mishka and The Hundreds and if you get there early, you might just be able to scoop up some of your most wanted deadstock Jordan releases from collectors selling off their prized possessions. The day will also be suppoted by a number of live musical performances, carrying on into the night. Off The Radar takes place this Saturday from 11am all the way until 2am. Full details on the flyer above.